Record turnout for MVRHS indoor track team. 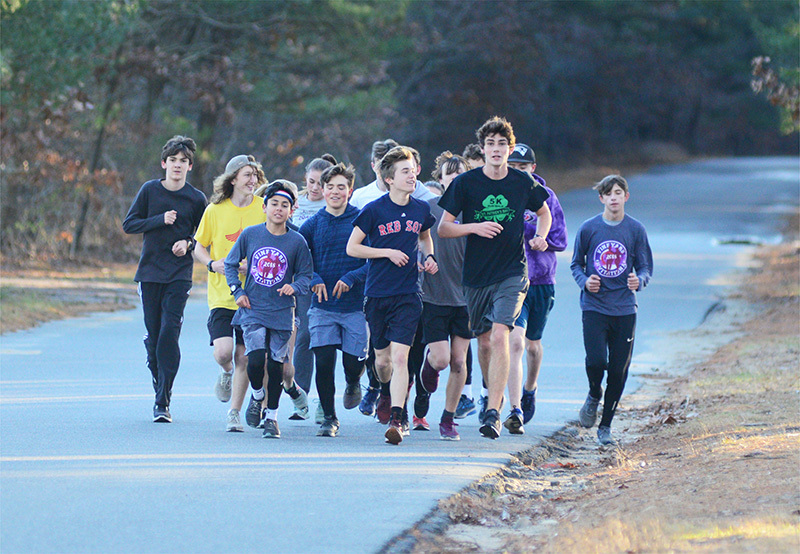 A record 56 Island high school students have committed to the winter indoor track program at Martha’s Vineyard Regional High School (MVRHS). The number stunned the track coach, Joe Schroeder, who’s been mixing and matching 25 to 30 athletes in order to compete in as many events as possible at meets over the past five years of the winter program. “Yes, it’s the largest group in my 30 years here, and it all happened suddenly, in one week in mid-November. I can see the signups online, and we went from 25 to 45 in one week,” he said last weekend. “We had 23 kids in 2016, and 30something last year. It’s starting to grow. Kids want to do something substantial and new in winter, be part of something special, I think,” he mused. Schroeder agrees that part of the “special” quality relates to the continuing growth of MVRHS track success, including unprecedented performances by the cross-country teams last month in EMass and state competition, and medal performances from the outdoor and indoor track teams last spring and winter. The team numbers mean a lot is going on now before the season opens against Bishop Stang on Dec. 11 at Wheaton College in Norton. “The coaching approach is the same, but a lot more teaching is going on. Kids are learning how to practice, how to approach meets, learning technique and form,” Schroeder said. “So we have a lot of sore legs right now. It’s called indoor track, but we practice outdoors. You have to be flexible, physically and otherwise,” he said. Assistant Coaches Joel Graves and Don Brown ae busy these days and cross-country Assistant Coach Mike Lavers has volunteered to help when needed, Schroeder said. The numbers on the team allow more kids more opportunities to compete across the range of events, and will provide relief for several veterans from the need to compete in the maximum number of events in every meet. “Mackenzie Condon is a four-event athlete, but for some meets she’ll be able to concentrate on several specialty events,” Schroeder said. Condon is a premier New England hurdler, and Peter Burke, a natural miler, moves up to the two-mile and down to 1,000 meters as team need has dictated, Schroeder said. “We’ll have no problem filling events this season, and we may be able to run in junior varsity events. We’re looking at adding a girls relay team in distance events. We’re fine in distance, most of the cross-country team moves to winter track, though the Porterfields (Owen and Nate) play basketball, and Yayla DeChiara and Margaret Sykes swim in the the winter,” he said. The Vineyarders are young. Captains Condon and Nate Packer, multievent athlete J.P. Alves, and javelin standout Rich Barlett are the returning seniors, and senior John Habekost has joined the team. “We’ll probably name two more captains as we go forward,” Schroeder said, noting the importance of senior presence on a team. “Seniors are more physically and mentally developed, so they have experience and pick things up quickly,” he said. But he also noted the quick development of Dash Christy, JoJo and Daniel Bonneau, and Tim Wallis on the boy’s relay and dash team, and the steady presence of junior Catherine Cherry, who emerged as a star distance runner as a freshman. Schroeder will schedule as many invitationals as possible, including the prestigious Dartmouth Relays, where Condon and Packer excelled last season, and the Auerbach Freshman/Sophomore meet at the Reggie Lewis Center, where the young Vineyarders turned heads a year ago. “There are lots of opportunities for kids to compete on this team,” Schroeder said.